Smoking is the new grilling. AMERICA IS going up in smoke: fragrant clouds of hickory, pungent blasts of mesquite, in new-school barbecue and a growing number of backyards. Smoking is the new grilling. It’s easy, but not always simple. Given that there are hundreds of models and dozens of smoker types—water smokers, egg-shaped ceramic cookers, pellet grills, offset barrel smokers and so on—you might be surprised when I tell you that you don’t need one to turn out competition-quality ribs and brisket. If you own a lidded charcoal grill such as a Weber kettle, you can smoke like a pro. If you don’t, buy one—it will make a useful adjunct to your gas grill. While you’re at it, pick up a bag of lump charcoal and a chimney starter to light it, plus some disposable foil drip pans and hardwood chips or chunks for smoking. Hickory, oak, apple, cherry, alder and mesquite wood produce subtly different but equally delectable smoke flavors. The truth is, the species of wood matters less than how you add it to the fire: ideally in chip or chunk form, dosed gradually throughout the smoking process. So how do you smoke on a charcoal grill? Follow these six easy steps. 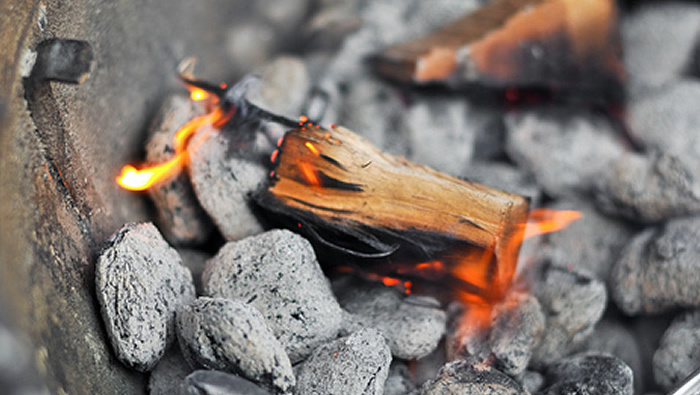 Light your charcoal (preferably natural lump—it’s pure wood, unlike briquettes, which often contain coal dust and petroleum binders) in a chimney starter. Dump the hot coals into two mounds at opposite sides of the grill’s lower grate and place an aluminum foil drip pan between them. Return the top grate to the grill and place the food to be smoked in the center of the grate, over the drip pan. Cover the grill with the lid. To regulate the heat, adjust the bottom and top vents—wide open for a higher heat, partially closed for a lower heat. To smoke low and slow (at 225-250 degrees, the traditional temperature for true barbecue) use only half a chimney of coals.